Wyoming has no laws prohibiting or authorizing open carry. When no law prohibits something, that thing is legal to do. "Liberty" means liberty to do anything not unlawful. The liberty envisioned by [Article 1, Sec. 6, Wy. Constitution] is not alone a liberty of person such as is offended by enslavement, imprisonment or other restraint. It contemplates a person's liberty to do all that is not made unlawful. Bulova Watch Co. v. Zale Jewelry Co.
Wyoming has no laws on carrying openly a long gun (rifle or shotgun). Please use discretion when doing so; while it is your right to carry a long gun in public, it does tend to alarm the public, even in gun-friendly communities and could be criminal, depending on your behavior (see above). Pistols have been a normal part of daily self-protection throughout the United States since its inception and are intended for such daily carry purposes. Please don't open carry long guns just to make a point; Wyoming allows you to openly carry handguns. Save openly carried long guns for dire circumstances when they're needed, such as a riot or a major disaster. Still, it's your right, so if you chose to openly carry a long gun, please exercise your right wisely. No person within or upon the facilities of a governing body shall refuse to desist from a course of conduct or to remove himself from the facilities upon request by an authorized representative of the governing body, after having been notified that the conduct or the presence of the person is contrary to or in violation of established policies, rules or regulations of the governing body which are reasonably related to the furtherance of the lawful purposes of the governing body and incident to the maintenance or orderly and efficient use of its facilities for the purposes for which acquired or designated. So-called Constitutional Carry (permitless concealed carry) applies only to Wyoming residents (state residents for at least six months). You must meet the qualifications for being issued a concealed firearm permit for permitless concealed carry to apply (see below). ​"Printing," where the imprint of your gun shows through your clothing, is not illegal anywhere in the United States. Be a US resident and been resident of Wyoming for at least 6 months. Not a federally prohibited person or convicted of a violent felony under state law. Has not been committed to a mental institution or currently adjudicated to be legally incompetent. Do not chronically or habitually use alcohol to the extent that your normal faculties are impaired. Non-resident military service-members in Wyoming should contact the DCI after July 1, 2016 for rules on issuance to them. ​You must demonstrate familiarity with a firearm. A legible photocopy of a certificate of completion of any of the courses or classes or a notarized affidavit from the instructor, school, club, organization or group that conducted or taught the course or class attesting to the completion of the course or class by the applicant or a copy of any document which shows completion of the course or class or evidences participation of firearms competition, shall constitute evidence of qualification. Honorable retirement as a federal or state peace officer who has a minimum of ten years of service. Proof of training will generally be in the form of a Hunter Safety Card, your DD-214 form (discharge papers), NRA handgun or licensed concealed carry training certificate. The division may deny a permit if the applicant has been found guilty of or has pled nolo contendere to one or more crimes of violence constituting a misdemeanor offense within the three year period prior to the date on which the application is submitted or may revoke a permit if the permittee has been found guilty of or has pled nolo contendere to one or more crimes of violence constituting a misdemeanor offense within the preceding three years. You are convicted of any offense involving a controlled substance, alcohol abuse while carrying a concealed weapon or any crime of violence or a plea of nolo contendere to any of these crimes. The department has 60 days to issue or deny the permit application. You have 30 days to submit an appeal of denial, which the department must respond to within 20 days. After that, you may appeal to district court. If you have been denied a Wyoming permit, you may not carry a concealed firearm under a permit issued in another state, so long as you remain a resident of Wyoming and you remain ineligible for a permit in Wyoming. You have 30 days to notify the department of change of address or a lost or destroyed permit. The duplicate fee is $5.00. The renewal form and a notarized affidavit stating that you remain qualified pursuant to the criteria above. Permits may be renewed up to six months after expiration and you must pay a $10.00 late renewal fee. After six months, you must apply anew. The sheriff of the applicant's county of residence may, at his discretion, submit a written report to the division recommending the issuance of a concealed firearm permit to an applicant between 18 and 21 years of age who meets the requirements. The division may issue a permit to carry a concealed firearm to those individuals between eighteen (18) and twenty-one (21) years of age under circumstances that a reasonable, prudent person would believe warrant the issuance of a permit to carry a concealed firearm. This does not apply to open carry. Concealed carry is heavily regulated. This may be regarded as a fortunate oversight by the legislature or a recognition that openly carrying firearms is constitutionally protected. Whatever the case, citizens and authorities are more sensitive to open carry, and in light of a lack of laws or court cases documenting an affirmative right to openly carry at the above locations, caution is advised. The permittee shall carry the permit, together with valid identification at all times when the permittee is carrying a concealed firearm and shall display both the permit and proper identification upon request of any peace officer, 6-8-104(b). Wyoming does not issue non-resident permits. 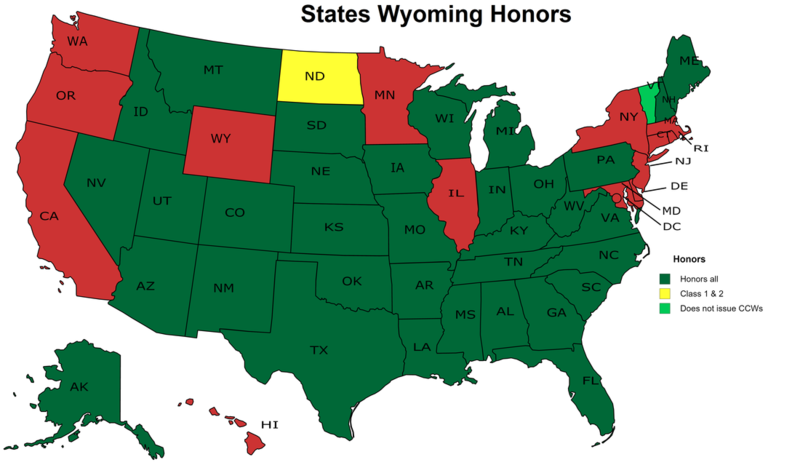 Wyoming recognizes all permits from all states that recognize Wyoming's permit and when the out-of-state permit is valid across the issuing state, 6-8-104(iii).